Kataru's love and pursuit of Farming: Weed problems at Carpenter. Very annoying.. 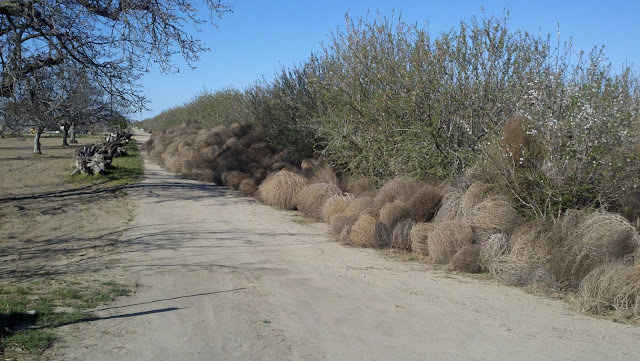 The abandoned open ground to the west of Carpenter ranch is fallow and a source of tumbleweeds (russian thistle) and vertebrate pests. 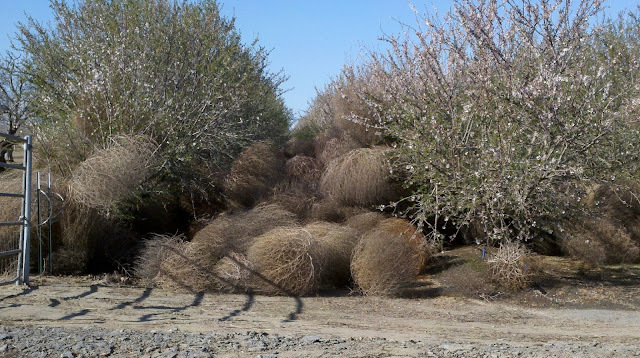 In the spring, the tumbleweeds which grew the previous year blow into our orchard and create a management problem. Some pictures to show the extent of the problem. With a great deal of effort, time and expense we were able to clean up what you see in pictures. Cleanup cost was about $2,000. Not happy about that. On top of this, the next time we have a strong North wind the whole situation will repeat itself. Additionally the abandoned property is a refuge for rabbits, coyotes and squirrels, all of which damage our irrigation system. Furthermore the squirrels hoard almonds and impact our yield. The solution is pretty simple for them. If the field is disked at the proper time in the spring it will clean up most of the weed situation and at minimal cost. Depending on rainfall, one, two or three diskings may be required. Time to talk to the city (attempts to contact the owner were in vain).